I’ve never been one to wear jewelry. I don’t have my ears pierced so you will never see me wearing earings. My wedding ring is a family ring that is a simple wide band with a cluster of small stones instead of a focal point. I’m simple. I enjoy being simple. 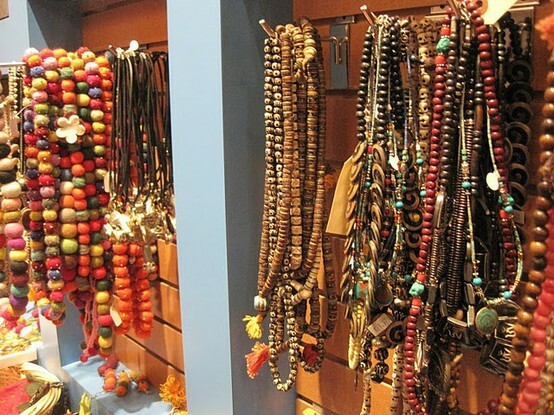 While I rarely wear jewelry, I hardly ever go anywhere without my mala beads. After my 30 day commitment to Blissology this spring, I found my mala beads (or they found me). Christian and Cole gave them to me as my mother’s day present. A few days after they arrived in the mail, I discovered that I was pregnant. Since then they have become a huge part of who I am. My mala beads go with me yoga. They sit on my mat and absorb the energy of the room. They are a part of my meditation practice. My mala beads have been with me at every child-birth class I’ve attended. My mala beads are at the top of my “must pack” list for the hospital. I know it is “just a necklace,” but they mean so much more to me than a pair of beads I wear around my neck. They symbolize all the intentions I have set for myself. They are a constant reminder of how I want to live my life, and they are a reflection of the person I know I am. I can’t imagine not having my mala beads with me. I can’t imagine not having my mala beads with me in the delivery room. My mala beads were going to serve as my reminder of why I’m having a natural birth. When I feel like I can’t do it anymore, my mala beads were going to be my visual reminder that I am doing it and that I can do it. Yesterday I was sitting at my desk at work talking to my mom. Out of no where I heard the beads tumbling to the floor. I looked down and the necklace had broken at the guru stone on the right side. The left side was still hanging in the middle of my chest. I quickly hung up the phone and my coworker Kate came to my rescue. She picked up all the beads for me off the floor (since I’m not graceful anymore). I put them away safely, and I emailed the company in Canada that sent me the necklace. My initial reaction to the beads breaking was sadness. I love my mala beads. I feel naked when I don’t have them on. I need them. I need them fixed before Chet’s due date because they have to be with me during delivery. Before I got a response from Tiny Devotions, the idea of restringing the necklace just didn’t seem right. The idea of buying a new one felt even more wrong. The idea of not having it makes me sad though. The owner of the company emailed me back to reassure me that they would restring the necklace if I’d like them too, but a mala breaking resembles a karma break through. The history and tradition of mala beads believes that if your mala breaks it represents karma breaking or a breakthrough. (This is not a bad thing, but rather a positive sign of progression. “I think this is a good thing she said.” After we explained the energetic links of a mala to karma she related it back to an experience that she had just had where she felt like a massive block for herself had just disappeared – shortly after – the mala representing this block became caught on something and broke. So what was my karma breakthrough? I’m not sure, but I do know one thing. I was drawn to my mala beads because of the guru stone. The Citrine stone is a powerful cleanser and regenerator that holds energy. It is the stone of prosperity, joy and abundance. It also helps inspire the exploration of possibilities. When I first found the necklace, I was drawn to idea of possibilities. I was searching for joy and abundance. Christian and I were on the fence about having another baby. I wasn’t unsettled on many questions in my life. I was searching for something. I was questioning my own strength. Over the course of my pregnancy, I know I’ve grown a lot as a person. I’ve discovered happiness in parts of my life that I never imagine would be comforting to me. In the past weeks, I’ve found peace with all the pieces of the puzzle that are my life right now. I’ve found confidence with my birth plan, acceptance with my body and what it is capable of doing, and joy in family life. I feel incredibly rooted to my life right now, and that is the only thing I truly want out of life. Maybe my mala beads broke because I’m ready for the next chapter in my life. I’m ready to discover what is next. My mala beads have carried the energy I needed to get to this point. I need to let go of the importance I’ve placed on this one item, and I need to trust that everything I love about my mala beads is within me. I don’t think I’ll be restring my mala. It feels like hitting rewind on life. I’m not sure what the next phase of my journey entails although I know it is great and exciting. I know it will make me a better person, wife, and mom. My next set of mala beads will find me just like this set did earlier this year when I was struggling to make sense of defining strength in my life. Although I don’t want to recreate this set of beads, I don’t want to forget about what they mean to me. I’m exploring ideas of how to repurpose the beads. I might create something to bring with me to the delivery room. I may create a different piece of jewelry, but I think they served their purpose as my mala beads. The next set will find me when I’m ready for it. I was once told by a friend that if an item that one owns and wears all the time suddenly breaks without reason, it is because that person who owns the item is about to come to some sort of harm, and the item-which loves the person who owns itself dearly–will put itself in harms way and sacrifice it self so that its’ owner will be spared of harm’s way. I hope you find something that feels right soon, but just thought you might appreciate this small story (be it true or not) just as I did when one of my personal favorite items broke for no reason. I love that story! Thank you so much for sharing it. I really do feel like it broke for a reason and that I find something new and right to take its place. I purchased a mala with Africa Jade over a year ago. I just returned from a trip to Africa, where my mala broke exactly at the same time as I discovered something very beautiful about myself. The beads spilled all over the floor, and due to my location, I was unable to collect them all. I have the piece of Africa Jade, and half the seed beads; however, half of the seed beads are still in Africa. I love that mala. I know that it broke exactly when it needed to… when I found the beauty and freedom within myself that I was purposed to find. A new mala… a new possibility… I’m ready now. I love this! Thank you for sharing it with me. I did replace my mala a few days before I went into labor with my son. The stone felt so cold and refreshing on my always hot skin. They meant so much to me. I feel like I’ve out grown them yet they are still with me. So I’m waiting…and know they have something special to teach me! It was so interesting to find this post, as I was just driving home from dinner with a close Buddhist friend, and my citrine Tiny Devotions mala just broke in the car. No reason! My friend had been sharing her wisdom with me over dinner, and I felt that I had learned some important things about myself….but the breaking mala on the way home took the shine off the evening. As I got out of my car, I could hear the seed beads and the larger rudruksha seeds hitting the ground and bouncing into the grass. I know I won’t be able to retrieve all the beads to restring the mala. And then I found this post and I saw the event in a whole different light. Much more positive! Thanks so much! Thank you for your comment! This is why I love my blog! It makes connections that would have otherwise never existed. Hello, and blessings to all! In 2009, I had just made a mala using extraordinary rutilated quartz crystal beads, and I took it with me to a Chenrezig Mandala dispersal ceremony. 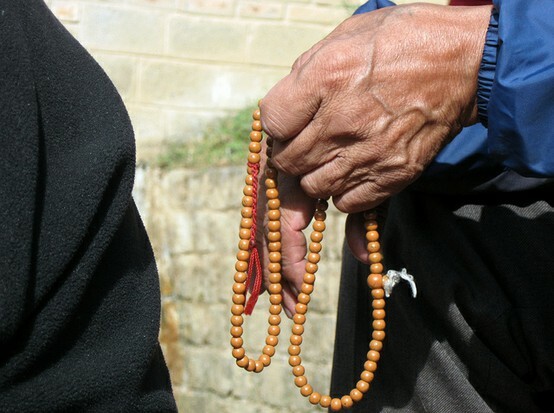 HH Ngwang Tenzin Rinpoche (a very respected teacher in Bhutan) was performing the ceremony, and while they were setting up, I decided to do some mantras, when right in the middle of the Chenrezig mantra, my mala broke, and the beads went everywhere. I was very fortunate to have four kind people help me find every bead (yay! ),and because I was very attached to the mala (attachment=one of the three poisons…argh! ), I felt heartsick; I was also attached to the idea of using the mala during the ceremony. When Rinpoche came in, I asked his assistant if Rinpoche could tell me what it means when a mala breaks. He told me that it is VERY AUSPICIOUS! He said that it symbolized ‘breaking’ a negative trait (or relationship, situation, phase, etc.). Receiving this (favorable) news from Rinpoche himself was so wonderful, and I knew right away what was ‘breaking’ in my life: my attachments–and it was revealed to me by my ‘favorite’ mala ‘breaking’, literally! So, if this has happened to you, be assured that it is a good thing! May any merit that is generated by this site and all of its readers be dedicated to benefit all beings! Om Mani Padme Hum! Thank you so much for these words!!! and for providing the perspective on attachment. Until you wrote this I hadn’t thought of my mala in that context, but you are absolutely right. And what I needed after it broke was to let go of my attachment to so many things. I am old now. I have had 3 experiences during my lifetime with malas breaking. The first occurred a few years after I began meditating. My life seemed to be falling apart after radical cancer surgery and a divorce and I felt sad and lost but committed to practice and the hope things would get better. One night while home alone, the Mala saved me from what could have been a catastrophic accident — as I tripped and lost my balance and started to fall, the Mala caught on a little knob on a cabinet and caught me from falling to the ground, even though the Mala broke. 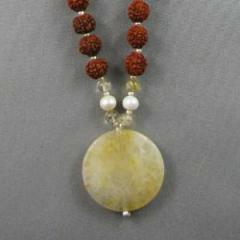 The second time a Mala broke occurred about 15 years ago after the death of a loved one. And recently I have been working through attachment and deep grief following a life review and family changes. I had completely forgotten these incidents until today and the memory of what followed the Mala breaking –that is, deep healing and auspicious events which ushered in a rebirth and New Day! Pingback: Why Does my Mala Keep Breaking? This happens all the time with Malas strung with rope – capping it with silver or gold solves the problem -; not sure so about karma break – usually rudrakshas are quite fragile by itself and these needs to be oiled with either mustard or olive (later is a 21st century alternative) but if you have no allergy problems go with mustard it goes with the fiery nature of the bead, pure Mysore Sandalwood oil will also work miraculously well as the antibacterial nature of the oil protects the beads. The key is to also cleanse the beads of negative energy as these absorb a lot from you and yes – maybe it absorbed too much ! Cleansing is done by drowning the beads or mala into oil overnight , it’s called the elimination of doshas. Feel better! May the next mala find you soon!